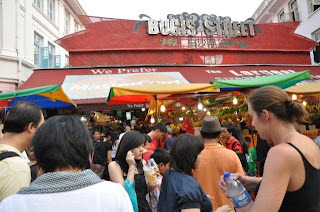 This market made the Pasar Malam in KL look like a Sunday stroll through the park. The clerk at the front desk of the hotel in Singapore told me to go there if I wanted to really see a market in Singapore. I lost all the feeling in my body when I got there. It was that overstimulating. I was in constant contact with some other body at all times. A shopping mosh pit. I bought things, though at the moment, I can’t remember what they were. I am most fascinated by the watches and t-shirts though. There are so many that just do not make any sense whatsoever. I know I bought myself a killer watch that is bizarre for just $3. I will have to check at some point what else I got. Rest assured, I am getting souvenirs for you guys who have given me advice. They are silly and small…but I am braving these markets for you and with you. This is my favorite picture. I am hiding upstairs in the only corner I could find that was not absolutely teeming with people. 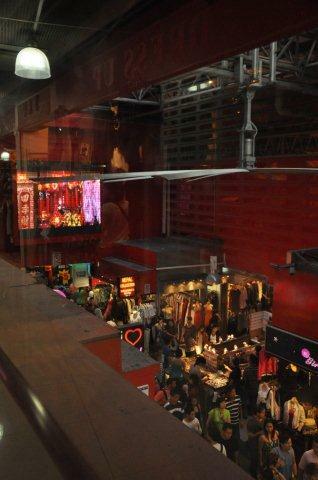 You can see the huge television screen that hangs above the market flashing advertisements and show segments from what appears to be a show on the market itself, highlighting particular stalls. You can’t hear it anything said on the TV though, as each stall is blasting out their own music. It is hilarious…hypnotic…dissonant. A crazy mash up of sites, smells and touch. There is a food court here, but I cannot feel my legs, much less my stomach, so getting food would have been a nightmare, even if I could have read the signs. To be fair, it is more common here to see the signs translated into English as well. More common, but not ubiquitous. And I am still one of a handful of people that are not speaking in one of the Asian languages spoken in Singapore. I had a surreal experience as I accidentally bumbled outside the market for a few blocks (it tapers down and does not end abruptly). But it is too surreal to include in a post about the market, so I will write a separate one on that next. As a teaser, it includes lotus flowers and praying. 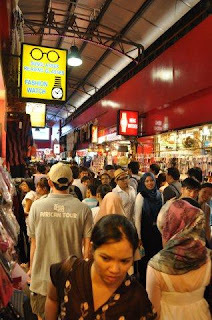 I am considering diving back into the Bugis street mosh pit tomorrow (Monday) when perhaps it is a teensy less crowded. I have to work, but I may knock off early and see how different the experience is on a Monday afternoon. I love you all for commenting and being “with me” while I am here. It is making all the difference in the world. You have no idea.